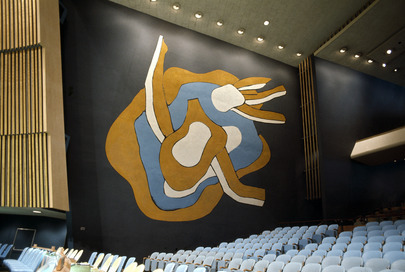 One of the two Leger murals in the plenary hall of the General Assembly building at United Nations Headquarters in New York. The murals were painted on the east and west walls overlooking the press area of the Hall, by Mr. Bruce Gregory, who studied for two years in Paris with the French artist. The mural is cadmium yellow medium, toned down, United Nations blue, and white on a dark grey background. 1971.